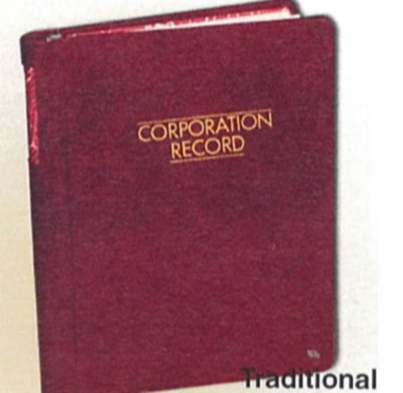 GENERIC CORPORATE RECORD BOOK - Ten Tab Indexed Sections-242 pages, complete with notes, outlines and forms for Seven Organization Procedures: Authentication, Subscription List, Articles and Certificate of Incorporation, First Meeting of Incorporators, First Meeting of Directors, By-Laws and Record of Minutes. For Six Accounting Procedures: Stock Register, Transfer Record, Dividend Book, Shareholders Ledger, Journal, General Ledger and 10 Forms and Precedents. Includes 12 KG2 Blank Certificates and 12 Transfer Sheets. STATE SPECIFIC CORPORATE RECORD BOOK - Ten Tab Indexed Sections-242 pages, complete with notes, outlines and forms for Seven Organization Procedures: Authentication, Subscription List, Articles and Certificate of Incorporation, First Meeting of Incorporators, First Meeting of Directors, By-Laws and Record of Minutes. For Six Accounting Procedures: Stock Register, Transfer Record, Dividend Book, Shareholders Ledger, Journal, General Ledger and 10 Forms and Precedents. Includes 12 KG2 Blank Certificates and 12 Transfer Sheets.